But Mary kept all these sayings, considering them in her heart (Luke 2:19). We pause this week in our meditations on the Hail Mary to consider what we are doing, and why. Mary is a model of Christian spirituality. As we considered at the end of our meditation last week, Luke’s Gospel constantly presents her as meditating on the Word. In fact, it goes deeper than that. Jesus says, “blessed are those who hear the word of God and keep it” (11:28). The Greek word he uses here for “keep,” phulasso, is about guarding: keeping watch, protecting. Earlier on, Luke gives several variations on, “Mary kept all these sayings, considering them in her heart” (Luke 2:19). Here the word for “kept” is syntereo, similar, though slightly different: here we are “protecting” by holding everybody together – like a shepherd. It is also a word used for remembering. It then adds that Mary “considered” these sayings, symballo. This word means putting things together; it can be used of two people in conversation, putting their heads together, or of one person pondering, putting it all together in their mind. 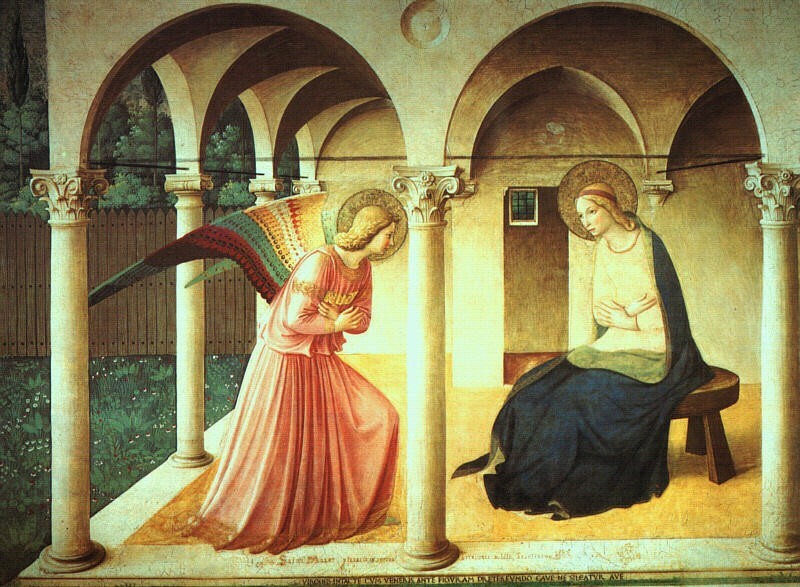 It is similar to dialogizo – when she saw the angel she was stirred up at his greeting, and “deliberated” what sort of greeting this could be (Luke 1:29). Here too the idea is of putting things together, as in dialogue with another person, but also in our own mind: ruminating on the words we have heard, pondering them, meditating on them. This is how traditional Catholic spirituality works. It is profoundly Scriptural. First, we “guard” the words of Scripture, hold them within us, fight to protect them from corruption, and not to lose them. We cling to the words of Scripture. Next, we ponder them, putting them together, considering. The tradition makes the Psalms the heart of its prayer life: memorizing, meditating, pondering, savoring, digging deeper into their meaning. Then lectio divina, which is simply meditative reading of the Bible. Also the rosary, which is a meditating on key phrases and events from the Bible. (And the original core was meditation on the words of the Our Father and the Hail Mary – the mysteries were added to help us ponder those words, not to substitute for them.) Various types of meditation, like the Ignatian exercises, are also just meditation on Scripture. In all of this we imitate Mary, who hears the word and keeps it (Luke 11:28), and indeed goes farther, keeping the word and pondering it (Luke 2:19, 1:29, etc.). Somehow in modernity Catholics came to think of vocal prayer, mental prayer, and contemplation as three different types of prayer. But in the tradition – and, indeed, in the Catechism – they are all one, perhaps summarized better in St. Benedict’s admonition, “let us consider how we ought to be in the sight of the Divine and his angels, and when we say the Psalms, stand in such a way that our mind may harmonize with our voice.” Vocal-mental-contemplation doesn’t mean we should seek contemplation apart from vocal prayer, any more than it means we should have vocal prayer without using our mind. Rather, when our mind attends to the words we are saying, that is the path to true contemplation. To be a contemplative is to pray like Mary: pondering the words of Scripture. So when we meditate on the Hail Mary, we are imitating Mary, learning to draw our spiritual sustenance from the words of Scripture. But in imitating Mary’s meditation on Scripture, we also discover Mary herself. Or rather, in meditating on the Gospel, we find the Gospel—and we find Mary as the personification of the Gospel. Mary shows us the reality of grace, and the power of the Lord’s being with us. When we look at Mary, we discover more profoundly that he really is with us: that God himself has become Mary’s son, our brother in the flesh. And when we look at Mary, we see what God-made-flesh comes to do: to transform us, to make us holy, to fill us with his presence. The Gospel has content. Christian contemplation, and Christianity itself, is not like Buddhism, where our minds check out and we fade into abstract unity. The Gospel – the presence of God, and the work of his grace – is something to be heard, received, and meditated on. It is like the rosary: a meditation on specific words and actions of God. But that meditation is not just for scholars. The Gospel, and Mary herself, is as simple and profound as the Hail Mary: simple words, rich in meaning, to be kept and pondered in our heart. Part 3 in our series on the “Hail Mary”. The two phrases are like two sides of a coin. “Full of grace” describes Mary on the inside (beloved of God, and gifted by God), whereas “the Lord is with you” describes her in relation to someone else. But in fact, the greatest gift God gives her is precisely his presence – there is no greater gift possible, no greater good, than to be with God. And Mary is beloved, “in God’s favor,” precisely because she is with God. In fact, Mary is totally relative to Jesus: we look to her to look to Jesus, to see who he is (God-with-Mary – God become man) and to see what he does (he fills us with grace, transforms us, brings us into his favor). Grace is nothing other than the presence of God. Grace is being made present to God. But let us consider what that means. The Fathers of the Church notice something funny in the story. “The Lord is with you” obviously refers to Jesus, right? He is Emmanuel, God with us. The Lord is with Mary because he takes flesh in her womb. When she stops to ponder this enormous greeting, this fabulous title given her by God, full of grace, she is not yet the Mother of God. He is already with her in a different way. And so it’s important that we pray, “the Lord is with you” not only during the mysteries of Jesus’s life, but also in his absence. The Lord is with her before he is in her womb; when she is searching for her child, disappeared into the Temple; in his agony in the Garden; and when he has gone up to Heaven, leaving her behind. In fact, meditating on how he is with her at these times helps us penetrate more deeply how he is with her in his physical presence. He is not only in her womb, but also in her heart, and in her voice, so that the infant John the Baptist leaps at her words: “as soon as the voice of your greeting sounded in my ears, the babe leaped in my womb for joy” (Luke 1:44). When he is with her before her eyes, dying on the Cross, he is also with her in her heart, giving her the courage to stand. Indeed, everyone who approaches Jesus is drawn from within: he acts in their hearts before he acts in the flesh: “No man can come to me, except the Father which has sent me draw him” (John 6:44). This is the real meaning of that strange encounter later in Luke’s Gospel. “And it came to pass, as he spoke these things, a certain woman in the company lifted up her voice, and said unto him, Blessed is the womb that bore thee, and the paps which thou hast sucked. But he said, Yea rather, blessed are they that hear the word of God and keep it” (Luke 11:27-28). The deeper mystery of Mary is not what happens in her womb, but what happens in her heart. And in this, she is model to us all of perfect faithfulness, of living the true presence of God. That is what grace means. That is what Jesus means. Part 2 in our series on the Hail Mary. Today we continue our journey through the Hail Mary, with the most important part of all. The phrase is from the Angel, who addresses her, “Hail, full of grace: kecharitomene.” It is a strange greeting. According to St. Luke, “and at his word she was troubled, and cast about in her mind what manner of salutation this might be” (Luke 1:29). The Greek is quite nice: it is at his word (logos) that she is troubled – Greek lets you put that forward and emphasize it in a strong way – and her grappling is die-logiz-eto: “dialoging,” but more to the point, bumping around this logos, grappling with the strange word that he uses. Why has he called her this? This is the name he gives her. He doesn’t say, “Greetings, you who are highly favored.” He says, “Greetings Highly-Favored,” or “Full-of-Grace,” as if it is her name. At Lourdes Mary told St. Bernadette, “I am the Immaculate Conception.” This is similarly bizarre language: not “I was immaculately conceived,” but I AM the Immaculate Conception. It’s who I am, what I am. Our Lady of Lourdes was just glossing this strange greeting of the Angel. Luke’s narrative is nicely crafted – sometime we can explore this at length – with parallels between Mary and Zechariah, in order to show how they are alike and how they are different. It’s interesting to compare here: Mary struggled with the word he used, but “when Zacharias saw him, he was troubled, and fear fell upon him.” The difference is intentional – just as when Zechariah is struck dumb, but Mary’s mouth is opened in the Magnificat. Mary isn’t scared, she’s just overwhelmed at this magnificent name she has been given: kecharitomene. “Full of grace,” gratia plena, is St. Jerome’s lovely attempt to translate this loaded Greek term. Isn’t gratia plena just about the most beautiful phrase you’ve ever heard? Let’s break down the Greek ke-charit-o-men-e – Greek lets you cram all sorts of information into a single word. The central concept is charis (the ending changes to a –t in most of its grammatical forms): grace. We will have to talk about what that means in a minute. The -o- indicates that something has happened to the subject. She is “be-graced” or just “graced”: there’s something that has happened to her. Ke- and -men- indicate the grammatical tense called “perfect.” That doesn’t mean (by itself) that she’s perfect. It means that the action is completed. Not “on the way to being begraced,” or “half way begraced” but “all the way begraced.” And, just a small nice note, the -e is a feminine ending. Because Mary is feminine. Not easy to translate, but you see how nice St. Jerome’s option is. Fully graced. Full-graced. But gratia plena is so much more beautiful. And you see how insufficient is the Protestant translation, “Highly favored.” Well, sure, but that does not signify (a) that this is a personal transformation, that has happened to her; (b) that it is complete (try “totally favored”! ); (c) that it is given to her as a personal name, or title (maybe “Highly-Favored”? ); or (d) that we are talking about grace, the core concept of the whole New Testament. Interesting, though: “favor” indicates two things, and they are both operative in the understanding of grace. In one sense, “favor” indicates what someone thinks of you. She is “in” God’s favor, he likes her. But in another sense, “favor” indicates what someone does for you: God has given her a favor. In fact, God, who is Creator, and who makes everything to be what it is, is the source of what makes Mary favorable. She is likeable to him (in his favor) because of what he has done in her (by giving her a favor). When God finds favor, it is not because he has changed his standards, but because he has changed us. The path to heaven is to be transformed by his grace, to become a new creation. He makes us new, just as he made Mary new – totally, completely, transformed by his grace. Everything else in the theology of Mary, in fact, ultimately hinges on this magnificent revelation from the Angel: Mary is Gratia-Plena, kecharitomene. And our hope is that God will favor us, too.